Our Virtual Reality Meetup has partnered with Lowe's Innovation Labs Holoroom for a community meetup! 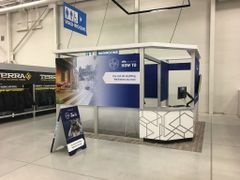 With well over 1500 stores in North America Lowe's has one of three VR retail activations right here in Burlington. Holoroom will have two of their VR techs on hand to demo and receive our feedback. "Holoroom How To is Lowe’s first-ever virtual reality DIY skills-training clinic. At Lowe’s, we know a critical part of helping people love where they live is educating them on the skills they need. With Holoroom How To, customers can learn basic DIY skills, including supplies needed and steps to completion in a fun, interactive VR environment. With our first module, customers can learn how to tile a shower in a fully-immersive environment, using the HTC Vive." Lowe's has taken a huge leap in the start of retail VR activations for education of DIY projects. This is a great case and point of discussion within our group. "Babylon VR is a web-based platform that makes creating and sharing Virtual Reality content easy for everyone. With an easy drag-and-drop system, set up a scene in minutes, publish your experience as a web link, and share with your friends! Virtual Reality has never been more simple to create and share with Babylon VR." They need feedback from our community and need to expand their user base as they develop this platform. We will discuss post VRTO 2017 Conference & highlights and also run some Microsoft Hololens mixed reality experiences. 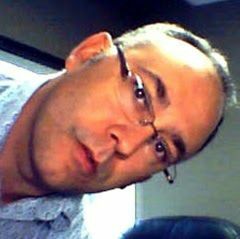 I had the pleasure of working with Keram Malick-Sanchez the director of the VRTO 2017 conference held in Toronto. Spoke to people from around the world about VR/AR/3D/MR/?R and had an amazing time. 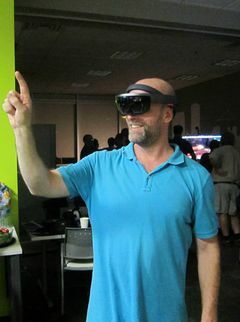 Also had my Hololens on hand to let people experience some mixed reality on the fly. This was an awesome event for so many reasons! We're also looking to run an Apple ARKit and some members will be working on that during the meetup. Setup, testing etc. Any members with ARKIt experience can work together. Refreshments will be provided. It's not easy getting people together in the summer so I hope to see you there! 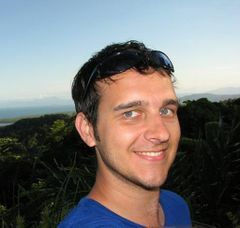 Tim Dashwood will also be dropping by to say farewell as he now lives in L.A., working with Apple. 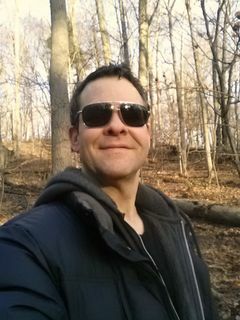 Famous for being the nicest guy and a true expert in his field, he's recently done technical work on Sir Paul McCartney's 360 experiences and a slew of other work spanning 20+ years in stereoscopy, MoCap, ActiveVR, 360 editing software, photography and cinematography. He was awarded Lumiere Honoree for 3D Technology by the Advanced Imaging Society. He will certainly be missed in our future Meetups. p.s., Lowe's Innovation Labs has contributed a $100 Lowe's gift card as an appreciation however you will have to RSVP and demo the Holoroom to be eligible to win this gift card in a draw at the end of the evening. * This event is free and open to everyone in the community. Drop by anytime within 4:30 - 7:00pm However I would suggest 5:30 as optimal.